Writing by Jody Miller and Aaron Tucker; diagrams by Jody Miller. In short, the ChessBard inputs the algebraic notation for a chess game in .PGN format (digital file format for archived chess games) and the Chessbard outputs a poem. The poems are based on 12 source poems Aaron wrote, 6 poems for the white pieces, 6 poems for the black pieces: there is a 64 word poem for each colour’s pawns, knights, rooks, bishop, queen and king. When a piece lands on a square it triggers a word from the source poems and the translator compiles them together and outputs a poem. 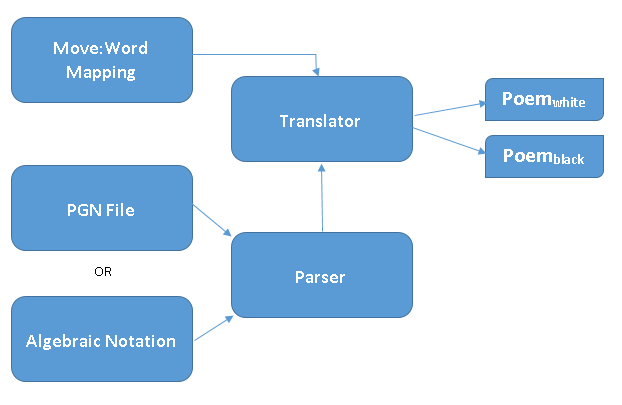 The site began in earnest in February 2014 with the first stage of the translator, a straightforward 1:1 translator. The first version is a pretty simple setup – the chess games in Algebraic Notation (whether pasted in or uploaded as a PGN file) are parsed and separated into their component moves. Each move that each player makes is looked up in the mapping for that player (for example White e4 = “resist”).This is a relatively simple database manipulator wherein each square corresponds simply to a word and the translator outputs that word without any syntactical or grammatical transformation. This stage of the project produces somewhat crude and “word-soup” poems, with the more-than-occasional burst of clarity and wit. While rough, this first stage was essential in that it provided us with some necessary clues towards how we needed proceed into the second stage. These tuples will map to words from our mapping table to yield a tentative line of poetry, say, “basket slowly walk great mountaintop.” As you can probably tell if you play chess, the number of such combinations is quite large and so not all such tuples will be defined. For those undefined, the program will draw on a “Word Pool” so that it may select a random word of the appropriate type (by part of language) to fill the gap where one has not been predefined. Postprocessing of the line may take place to fix common problems including such things as removing instances of double ‘the’. The program will then select a new line template at random, slice it at random, and carry on for the remaining moves to generate the rest of the lines of the poem. The process then repeats for the black player. Using this stage of the translator we’ve populated the site with pages devoted to famous players, famous games, as well as specific openings and defences. Visiting those pages will direct you towards suites of poems under those themes. The Chessbard 3.0 is a playable version of the program wherein we grafted our translator to a chessplaying app so that a human player can compete/write with/against The Chessbard. However, to make game play more interesting as well as visually appealing, we had to redesign it to be able to generate the poem one move/word at a time, rather than all at once. 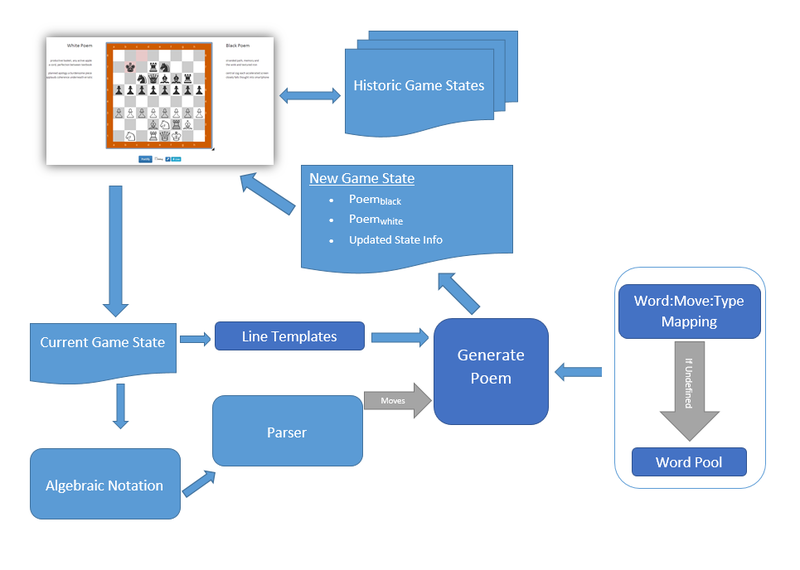 This made it necessary to track the game and poem state as game play progressed, as well as past game states so that players can move back through the game as they please. At this third stage, we are particularly interested in the ever-increasing collaborative relationship between user-computer, especially as it relates to the increasingly technologized relationship of writer-computer. 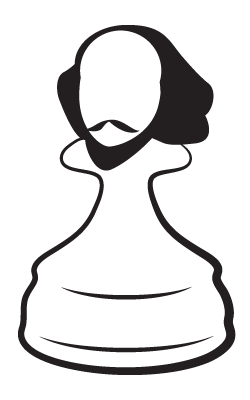 The human player can adjust the “strength” of the Chessbard and watch, playing either the black or white side, as the two entities create two separate poems, each poem dependant on the other. For a further exploration of the project’s poetics and goals, please visit/read the poetic statement hosted on this site. 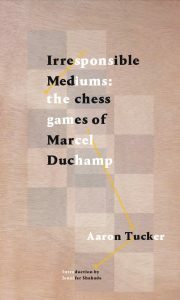 We want to make this site a communal space to play and writer and, as such, we have invited a number of players (some poets, some scholars, some chess players) to play against the Chessbard and have their games translated or to find a compelling game from the past and translate that. What is most interesting to us, then, is having those players write some form of a response (poetic or otherwise) that could also be hosted on the site as well. We’re always looking for future contributors so, if you’re interested, please email Aaron at atucker[at]ryerson[dot]ca.